HHN 27 The Purge Scarezone Update and where did Sam go?!? I went to Universal Studios Florida this morning to do a HHN 27 update and found some new things out for The Purge scarezone! The school bus is out with a platform rigged to the top of it. The Macy's windows revealed to display signs related to The Purge! There's now a prop next to Auntie Anne's at the entrance to Sting Alley. And finally, there have been two objects placed in the cage on top of the car that has been sitting near the restrooms by one of the entrances to the arcade in New York. There were also a couple updates made to the Trick 'r Treat scarezone. Most notably, the two "Sam" figures that were lurking in the grass were completely removed. 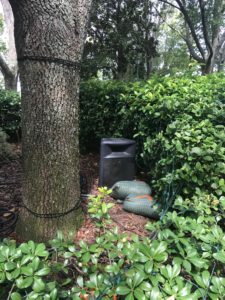 In one of their places is now a speaker and two sandbags. There is also a new figure on a doorstep wrapped in a camouflage tarp and another prop that was covered in a white sheet is now covered in camo. Both of those are show in the video below. I wonder if more things might be covered like that or even completely removed in preparation for Rock the Universe taking place next weekend. Be sure to subscribe on YouTube to see more HHN Prep Update videos! Until next time, catchy catchphrase! “Art Drop Day” is this week!